Panama’s Copa Airlines has unveiled plans for more rapid network expansion in 2014 with three new destinations to be launched in mid-2014. 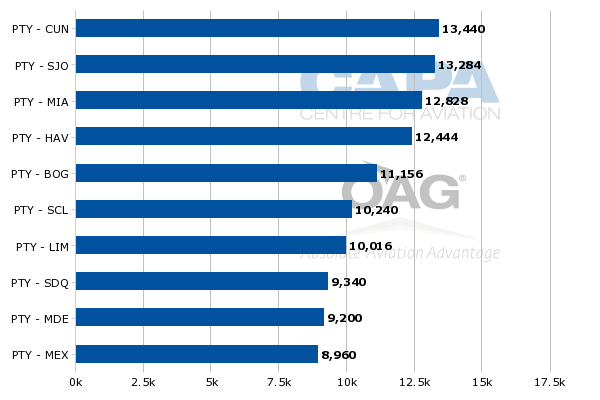 The carrier plans to expand capacity by 10% in 2014 as eight aircraft are added, representing the ninth consecutive year of double-digit ASK growth. Fort Lauderdale in Florida and Georgetown in Guyana are being added while Montreal will become Copa’s second Canadian destination after Toronto, which Copa launched in mid-2011 with four weekly flights. Panama forged a new air services agreement with Canada in late 2013 which enables Copa to operate five additional frequencies. Copa is a member of Star but does not codeshare with Air Canada, which has not generally been receptive to Copa’s expansion in Canada. Copa currently only codeshares with three Star members – United, Asiana and Avianca – but will likely add more Star partnerships in 2014, including with TAP as the Portuguese carrier is planning to launch services to Panama in mid-2014. The Copa group currently operates an all-narrowbody fleet of 90 aircraft – including 64 737NGs and 26 E190s – and serves 66 destinations. 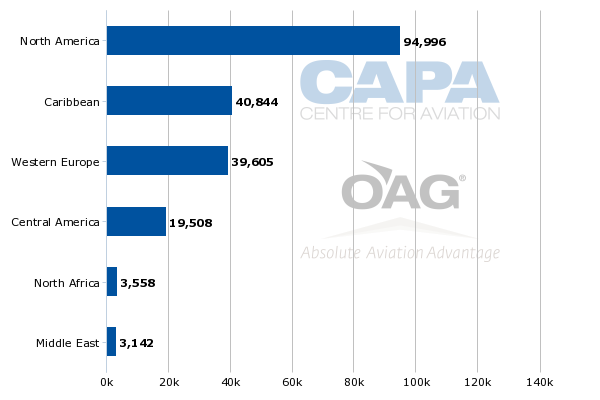 According to the CAPA Fleet Database, the group's Copa Colombia subsidiary operates 17 of the group’s aircraft (14 Embraer E190s and three 737-700s) while the remaining 73 are based in Panama and operated by Copa Airlines. The group plans to add eight aircraft, all 737-800s, in 2014, giving it a fleet of 26 E190s, 18 737-700s and 54 737-800s. The group’s main hub is at Panama City as Copa Colombia is primarily focused on linking several Colombian cities with Panama, although it also operates a limited number of domestic routes and point-to-point international routes from Bogota. All but three of the group’s 66 destinations are now linked to the main hub in Panama City, which has emerged as the largest airport for travel in the fast-expanding intra-Latin America market driven by rapid expansion at Copa and proactive expansion by Panama City Tocumen Airport. Tocumen and the Panamanian government have been highly supportive of Copa’s growth, investing in continued airport expansion while other major airports in Latin America have fallen well behind the growth curve. This has given Copa and Panama a competitive advantage in targeting the intra-Latin America market as well as providing an unmatched range of city pairs from North America and the Caribbean to Latin America. ASK growth has also been double-digit every year since 2006, including 14% in 2013. Copa plans to slightly slow down its growth rate in 2014 to a projected 10%. While Copa is planning its lowest annual capacity growth in 2014 since it went public in 2005 there will still be sufficient additional capacity to continue growing its network. It will also be sufficient capacity for Copa to continue growing its overall share of the intra-Latin America market, which saw RPK growth of about 8% in 2013 based on data from Latin American airline association ALTA. On 22-Jan-2014 Copa announced plans to launch three new destinations from Panama City – Fort Lauderdale, Georgetown and Montreal. Montreal will be served with four weekly flights from 3-Jun-2014; Fort Lauderdale with four weekly flights from 11-Jul-2014; and Georgetown with two weekly flights from 11-Jul-2014. Georgetown will be Copa’s first destination in Guyana, which is one of only three countries among the 13 in South America which the carrier does not already serve (the others are French Guyana and Surinam). Georgetown is a typical new destination for Copa as it is a small market off the radar screen of Latin America’s other airline groups but with potential to support a low frequency highly profitable service if connected to the right hub. Copa is often the only viable option for such markets, giving it a huge competitive advantage as Georgetown is a market unlikely to see significant competition and any service from low-cost carriers. 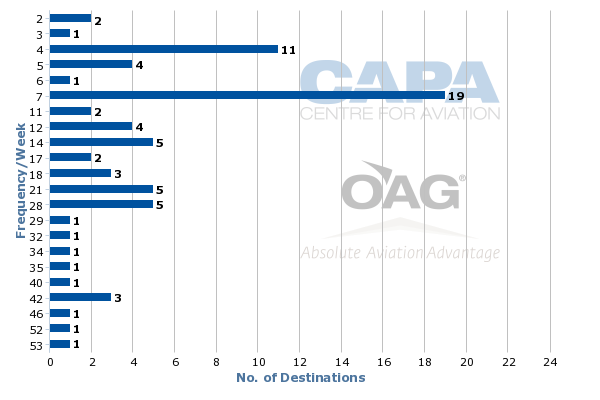 Georgetown is currently only served by four foreign carriers – Caribbean Airlines, Fly Jamaica Airways, LIAT and Surinam Airways, according to OAG data. Caribbean Airlines and Surinam Airways are essentially de facto flag carriers as they serve Georgetown from their hubs in neighbouring Surinam and Trinidad and also provide non-stop services to select markets in North America where there are large Guyanese populations. Guyana does not have its own flag carrier but only small turboprop operators which predominately operate domestically (with a limited number of international services from Georgetown’s domestic airport to Surinam). Surinam Airways currently provides Georgetown with its only non-stop link to Miami in addition to service from its main hub at Paramaribo but is a relatively small player with only two weekly flights on each route. Caribbean Airlines is the market leader with four weekly non-stop flights from New York and two weekly flights from Toronto in addition to 30 weekly flights from its hub at Port of Spain. Fly Jamaica operates three weekly flights to Kingston with continuing service to New York while Caribbean regional carrier LIAT operates daily services to Georgetown from Bridgetown in Barbados. Copa will provide new competition in Guyana’s largest markets of New York, Toronto and Miami while also opening up a large range of new one-stop destinations, as all the existing carriers in the market have relatively small international networks. Small markets such as Guyana are key to Copa’s overall strategy of offering hundreds of unique one-stop city pairs that have only a handful of passengers per day but when added together provide sufficient traffic to support a less than daily service. Over half of Copa’s routes are currently served with one daily flight or less. While Copa focuses most of its additional capacity each year on thickening routes there will always be exclusive markets like Georgetown which will likely never be able to support a daily service but are profitable and important components to the network. Fort Lauderdale will be the carrier’s fourth destination in Florida and the 10th in the US. In Florida Copa already serves Miami, Orlando and Tampa with Tampa having just been launched in Dec-2013. Panama City-Miami is Copa’s third largest route based on seat capacity after Panama City to San Jose in Costa Rica and Cancun in Mexico. Copa currently operates six daily flights to Miami. Fort Lauderdale will supplement Miami as both airports serve the greater Miami/South Florida market. Copa will join Avianca as the second Latin American carrier serving both Miami and Fort Lauderdale. Currently Spirit Airlines operates from Fort Lauderdale to Panama City while Copa competes with American in the Miami-Panama City market. Spirit is the only low-cost carrier currently serving Panama City but has only three weekly frequencies in the market. Even as Copa enters Fort Lauderdale it will not compete directly with Spirit as Copa focuses on a different segment of the market and relies heavily on transit passengers. Tampa along with Boston, which was launched in Jul-2013, were Copa’s only two new destinations in 2013. The carrier decided in 2013 to slow down network expansion and instead focus more on expanding capacity to existing destinations. Copa added five destinations in 2012 and a record nine destinations in 2011. Fort Lauderdale will be the third US destination Copa has added within one year. Including Montreal, North America will account for three of the four Copa destinations have added since mid-2013. The increased focus on North America comes as the number of potential new destinations in Latin America has become relatively limited given the strength of the carrier’s network in the region. Adding more North American destinations also provides better balance as less than one third of Copa’s destinations are in North and Central America. But there are also big opportunities for Copa to become the first Latin American carrier in several of the North American markets that have substantial traffic to Latin America but have no non-stop services. Copa is perhaps the only Latin American carrier that has the network to make smaller North American markets such as Boston, Tampa and Montreal viable. Copa is the only Latin American carrier in Boston and Tampa and operates the only non-stop service from either airport to Latin America (excludes Mexico and the Caribbean). The Boston-Panama and Tampa-Panama local markets may be small but with connections to virtually every possible destination in Latin America (major and secondary), the routes become viable. Copa will enjoy a similar distinction in Montreal, which is served by about 20 foreign carriers but no carrier from Latin America with the exception of Aeromexico. There are several low frequency routes from Montreal to Mexico and Costa Rica, operated by several Canadian carriers and Aeromexico, but these are mainly leisure point-to-point markets and do not generally offer connections into South America. The only exception is Aeromexico, which offers one daily flight from Mexico City, but Aeromexico has a limited network in Central and South America. Canada represents a modestly sized but important growth market for Copa as it continues to build on its already leading network connecting the Americas. The Canada-South America market is underserved, with non-stop services available on only five routes – Toronto to Bogota, Caracas, Lima, Santiago and Sao Paulo. Air Canada is the only operator of all these routes, providing only 24 weekly flights – seven to Sao Paulo, five to Santiago, five to Caracas, four to Bogota and three to Lima. The Santiago flights continue onto Buenos Aires, providing a one-stop same plane product. In launching services to Toronto in mid-2011, Copa opened up one-stop connections from Toronto to almost 30 markets in South America, providing in many cases the most convenient routing as Air Canada only serves six of these destinations. Copa also serves over 20 destinations in Central America and the Caribbean but for passengers coming from Canada or the US these require backtracking. In most cases quicker connections are available on other carriers and in some cases non-stop services are available in the Canada-Caribbean/Mexico/Costa Rica markets. Copa was originally capped at four weekly flights to Canada, which limited its ability to expand in Toronto or launch services to additional Canadian cities. Copa and Panama have been pushing for greater access to the Canadian market. But Canada has traditionally taken a protective stance in opening up markets which have limited local demand and have airlines that rely predominately on sixth freedom traffic. In Nov-2013 Panama was able to forge an expanded air services agreement with Canada. But Canada was only willing to increase the number of frequencies allowed from four to nine. Copa moved almost immediately to put in place plans to use four of the additional frequencies for the new Montreal service. The carrier plans to also use the ninth available frequency but needs to wait until Nov-2014 as the agreement specifies that the last of the five additional frequencies cannot be used until Nov-2014. Copa is now evaluating whether to use the extra frequency to expand in Toronto or Montreal. But it will almost certainly use all nine frequencies as the demand is there to support all of the extra flights and then some. Copa would add even more capacity to Canada and would consider additional Canadian destinations if the revised cap was lifted. Panama and Canada have a close relationship, with a free trade agreement that went into effect in early 2013. There should be open skies between the two countries as it would improve access to Latin America to the benefit of Canadian consumers. But Air Canada’s vehement opposition to opening markets that have a high dependence on sixth freedom traffic makes open skies unlikely. Air Canada is in the same alliance as Copa – Star – but does not work with the carrier beyond the required frequent flyer reciprocity. After Star accepted Copa and Avianca as new members in late 2010, Air Canada forged a codeshare partnership with Avianca but has so far opted against codesharing with Copa. Air Canada sees Copa as a threat to its existing Latin American business. For offline destinations in South America it prefers to work with Avianca, which provides connections beyond Bogota and Lima. As Avianca does not serve Toronto from any of it South American hubs, Air Canada is able to carry South America-bound passengers on its metal to Bogota and Lima. Avianca only serves Toronto from San Salvador in Central America, where it has limited connections to South America as its main hubs for South American traffic are Bogota and Lima. Copa formally entered Star in mid-2012 but currently only codeshares with three Star carriers – United, Asiana and Avianca. United is by far Copa’s closest partnership, which dates back to Copa’s strong partnership with legacy Continental. For several years Continental had an equity stake in Copa. 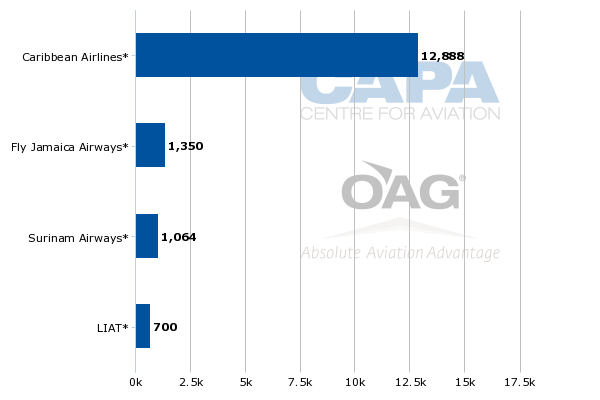 Copa will likely add more codeshare partnerships with Star carriers in 2014. A partnership with TAP Portugal is particularly logical as TAP will launch services to Panama City on 1-Jul-2014. TAP will be the first long-haul Star carrier to serve Panama and only the fourth Star carrier in Panama City after Copa, Avianca and United. TAP will become the fourth European carrier to serve Panama after Air France, KLM and Iberia. Air France in Nov-2013 joined sister carrier KLM, which has been a longstanding codeshare partner with Copa, with service to Panama City. As CAPA reported in Dec-2013, it is somewhat surprising it has taken over three years since Star approved Copa as a new member for Panama to attract another Star carrier. The Star Alliance has a 90% share of capacity at Panama City and Copa’s unmatched Latin American network should make it an attractive partner to other Star carriers. Copa has tried to attract Asian members to Panama but for now non-stop services to Asia are unlikely. However, there should be more opportunities to codeshare with Asian carriers to supplement the partnership with Asiana, which was added in 2013. Copa and all of Star’s other North Asian members – All Nippon Airways, Air China and EVA Air – have multiple common gateways in the US. Thai Airways and Singapore Airlines also have common US gateways with Copa although these carriers only serve the US with one-stop products. Copa could also potentially work with European members other than TAP via gateways in the US. But its relationship with SkyTeam member KLM, which was grandfathered as it came long before it entered Star, provides much better access to Europe as KLM serves Panama directly. Even the TAP service will be more limited as the Portuguese carrier initially will serve Panama on a Lisbon-Bogota-Panama City-Lisbon routing, providing non-stop services to Europe only on the outbound leg. Ultimately more Star carriers will be attracted to Panama, leading to more codeshares for Copa as tie-ups with carriers that do not serve its hub has rather limited value. Even Air Canada could have a change in attitude and be attracted to Panama and a Copa partnership. The benefits of plugging into Copa’s Panama hub, which provides unrivalled access in one of the world’s fastest growing emerging markets, are huge.